In the todays world advertising is the main way to bring a product or a brand into the market or if a brand holders wanted to introduce a new product to people there is only one way that is advertising. By advertising, brands can interact with consumers and customers etc. To advertise we have seen many of offers or social media platforms like Facebook, twitter and YouTube, these are the best way to advertise. But this article talks more on a decentralized ecosystem called Viral Advertising Network Mining (VANM). 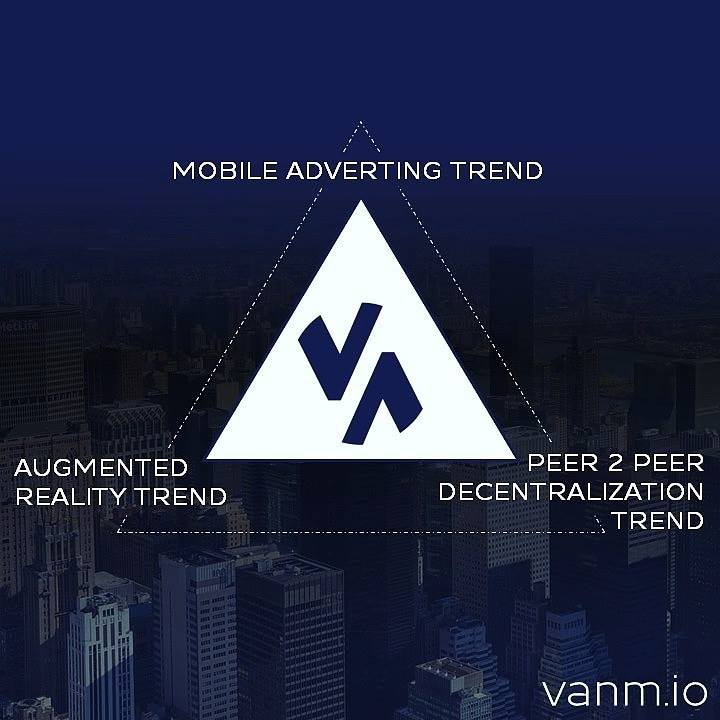 VANM is blockchain based technology platform that is designed as a local search engine for products and services that match ads: Which offers and is in Real-Time Request mode with the closest user. 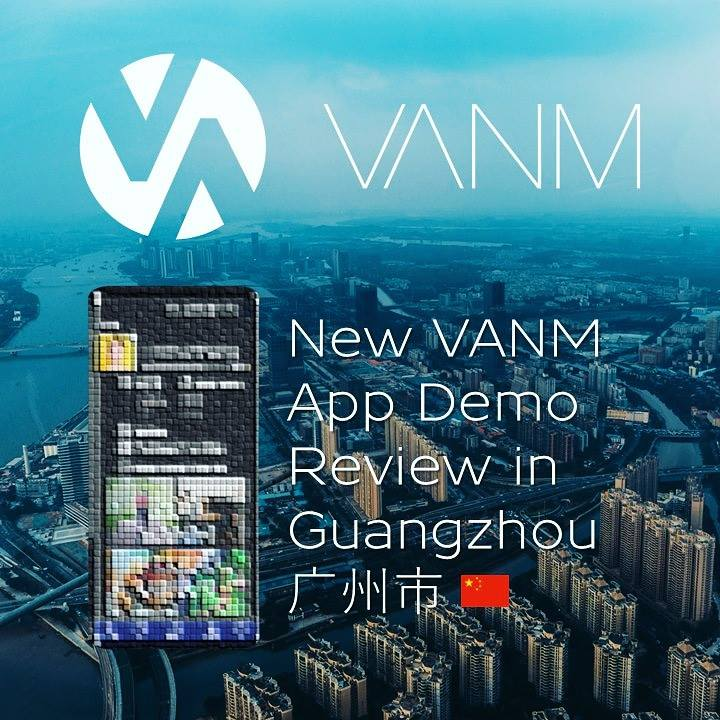 Blockchain technology is used in VANM to distribute advertising transaction revenue among users. VANM. will create an advertising platform that is 100% scalable, transparent and secured. 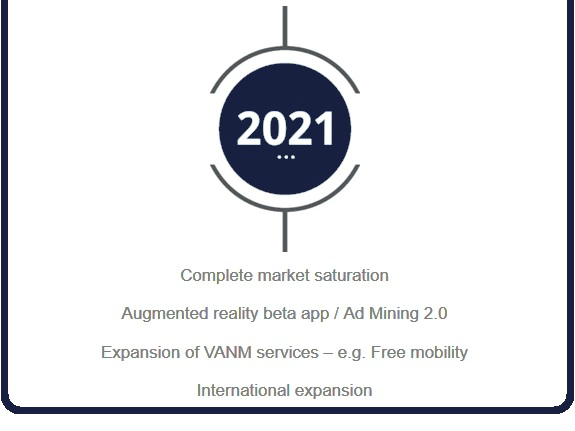 The VANM token will be distributed among future users of the platform in exchange for Ethereum and thus the holdings will be decentralized. On this page you can find out all the details about our Token Sale. 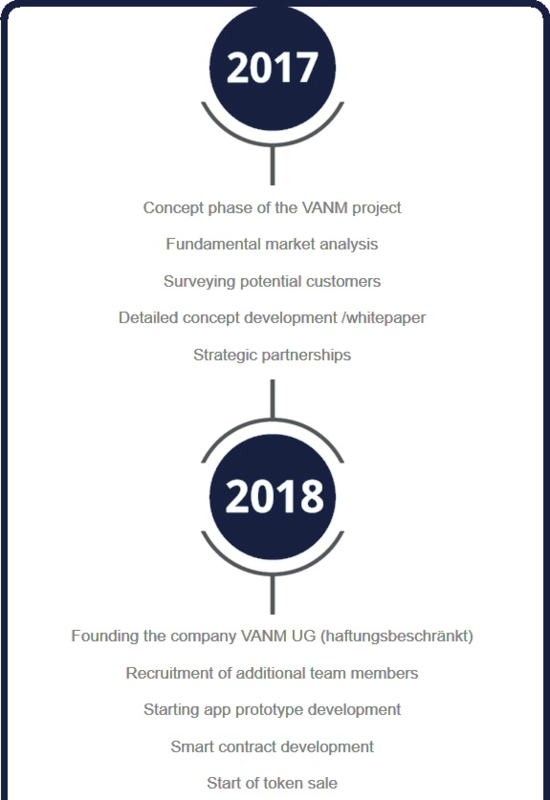 The VANM Token is the digital currency of the developing VANM ecosystem. It serves to transfer value within the network quickly, securely and almost feeless. The VANM token was created as an ERC20 token on the Ethereum blockchain and can be found at the following address on etherscan.io. Advertisers can use it to place advertisements and can receive it as a regular means of payment. Social media artists receive tokens, in return for the creation and sharing of content with their community. 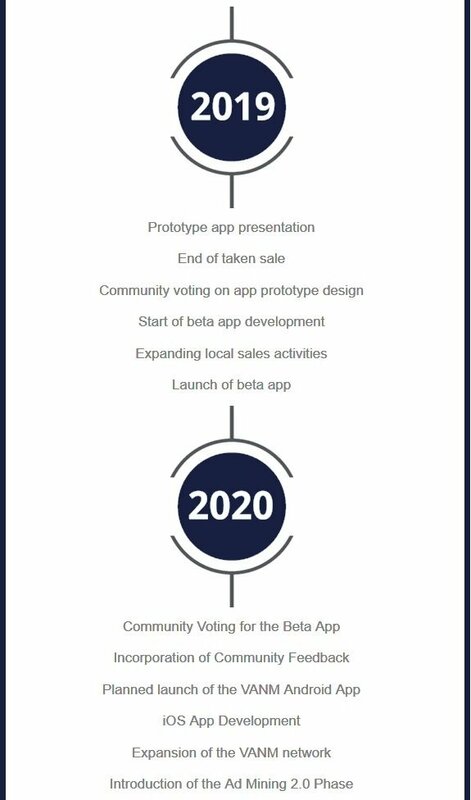 Users can earn tokens through their use of the app and also utilize the token as means of payment for products and services from participating vendors. A total of 240 million VANM tokens were generated. With this amount it is possible to cover the expected transaction volume. 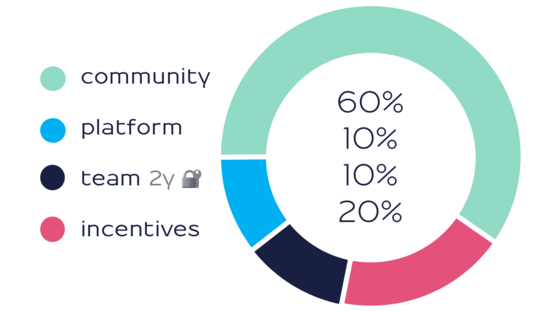 The second largest share, 20% of all tokens, serves various incentive programs such as rewards for beta testers or discounts for early adopters. 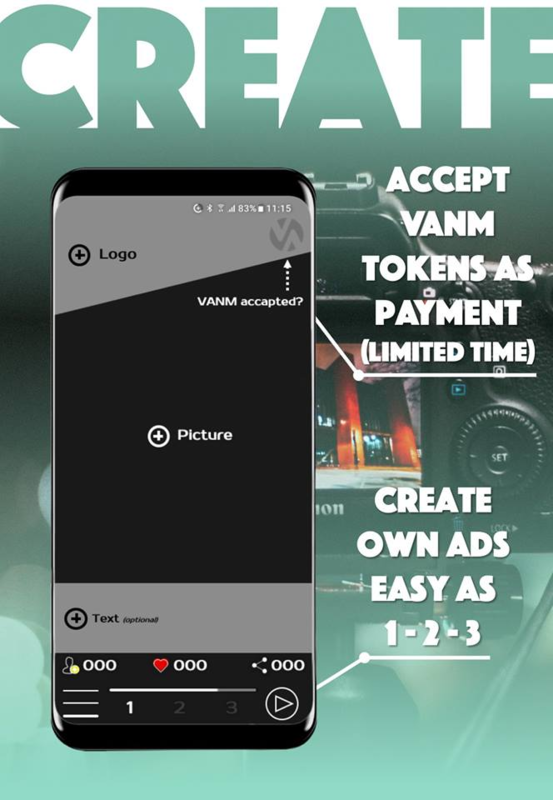 10% of the total VANM tokens serve as a reserve for direct sales after the launch of the official VANM App. Another 10% will be awarded to the core team. The team share will be blocked for two years and can only be claimed after this period has expired. This blocking period is comprehensibly anchored in the VANM Token smart contract.